Your attitude is a state of mind and the way we perceive things. It is what sets us apart from others as far as anything in life is concerned. It represents your likes and dislikes. Attitudes can be defined as positive, negative or neutral perceptions of certain things or ideas. Attitudes can be formed as different forms of judgments that may be true or untrue. As people grow up seeing things around them, they can form attitudes based on what they see. What they see can affect their perception of a certain person, thing or idea. Attitudes are part of a person’s personality and the well being of a person. Attitude is responsible for projecting a personality, be it positive or negative. Your personality can be a factor in determining a mental state of being and contributing to the ageing process. Your attitude can also be defined as a form of an egotistical state of mind, regardless of whether it’s about acceptance, expression of control or other traits that are considered to be selfish in nature. If you are continuously angry and feel a hatred towards others, that can be described as having a negative attitude. These forms can affect how you think and act towards others. When you start having negative thoughts, you open yourself up to premature aging and possible health issues. It’s very important that you steer clear from having a constant, negative mindset. Of course, this transformation takes time. After all, you didn’t form these negative thoughts overnight. You have to work at making an honest effort to change your attitude and your outlook about things. If there were things that bothered you in the past, you have to release them and move forward. Being bitter will not help you; it will only accelerate the aging process and could also affect your health, physically and mentally. It’s easier and healthier to look at the bright side of life. Doing this will refresh your mind and your body. Don’t let things that are out of your control get you down. A lot of times, it may be out of your control. Don’t be mean to people because they are mean to you. Being nice will help to maintain a positive attitude, no matter what the situation is. 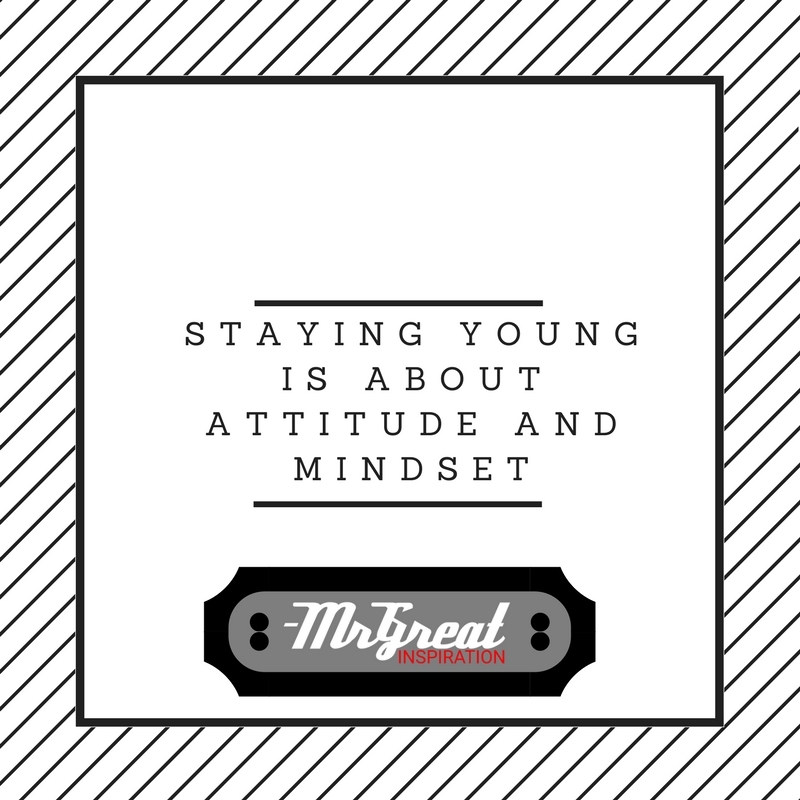 We hope guys you find our article "Staying Young Is About Attitude And Mindset" by Mr Great Inspiration useful.